Category Archives: blog 10 what’s in a name? I am named for a dragonslayer. Which is pretty cool. 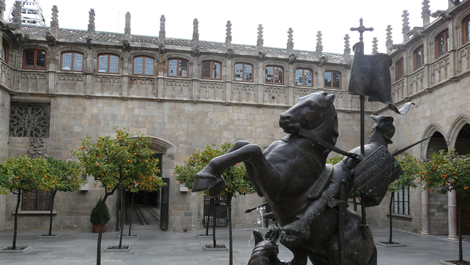 Sant Jordi in the Plaça de Tarongers in the Generalitat- the gvernor´s mansion for Catalunya. This is only open to the public one day a year… April 23rd. My name is Elizabeth Anne Semeraro. Hiello (thick Russian accent) Mr. Bond….I have been expecting you…. Uncertain Ancestry…Greek Gods…Infamous folks…all themes that popped up during my research. AncestrydiscoverynamesoriginWhat does my name mean?